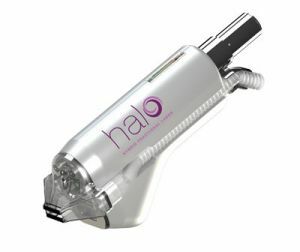 Halo™ is the world’s first and only tunable hybrid fractional laser, combining non-ablative and ablative wavelengths in a single pass to maximize results and control downtime. Halo™ combines deep dermal revitalization with epidermal renewal. By triggering the skin’s natural healing response, tone and texture are visibly improved and a more youthful glow is restored. A topical anesthetic is all most patients need to experience very little discomfort. Halo™ gives you the results you want without the downtime you would expect. Get the actions of three lasers in one treatment! Our Halo™ results will last for years to come, but you should continue to keep your skin protected at all times using UV sunscreen to protect your new, healthy skin. Each additional Halo treatment you get will only improve the results, giving you even better looking skin. Schedule an appointment today to see if our Halo treatment is right for you!